October 2013 Everyone is talking about the World Record Pizza! The Dirt Road Cookers, a team of eight caterers from San Antonio, Texas, broke the World Record for the largest pizza. The 46.64 square foot pie weighed about 100 pounds and took nearly two hours to cook. Kurt Oefinger, head chef and owner of Dirt Road Cookers catering in Hondo, will try on Saturday, Aug. 3, to set a world record for the largest commercially-available pizza. His team of eight people will work on an 8-foot pizza from 10 a.m. to noon Aug. 3 at the Guinness World Records Museum, 329 Alamo Plaza (across from the Alamo). You are probably asking yourself what a 46 square foot pizza has to do with Dirt Road Cookers, right? 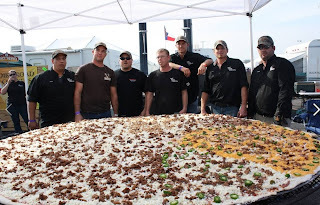 Nothing, except for the fact a San Antonio, Texas area company named “Dirt Road Cookers Catering” will attempt to set a Guinness World Record Saturday, August 3, 2013 at the Guinness World Records Museum at 329 Alamo Plaza for the “largest commercially available pizza”. The event takes place from 10AM-Noon, the public is invited to watch and spectators will get to try a slice once the attempt is complete. We wish the fellas good luck and much success in their attempt. Considering their great taste in names, we bet the pizza taste awful darn good too! You can read more about the attempt here.